Joe McKeever has been a partner with Davis & Harman LLP since 1985. 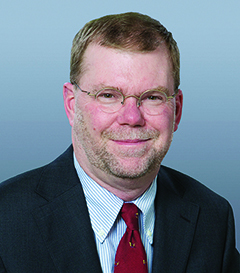 His practice focuses on the Federal income taxation of life insurance company products and ranges from advising individual life insurance companies on specific product design and compliance issues to representing the interests of the 29 member companies of the Committee of Annuity Insurers before Congress, the Treasury Department, the Internal Revenue Service and the Department of Labor. Joe has extensive experience in dealing with both the National Office of the IRS and various IRS field offices. Joe has served as Chair of Davis & Harman’s Ethics, Tax Practice, & Risk Management Committee for a number of years. Joe is immediate past President of the Insurance Tax Conference. He has served as Chairman of the National Association for Variable Annuities (now known as the Insured Retirement Institute) and of the American Bar Association Tax Section, Committee on Insurance Companies and was on the Advisory Committee of the FBA Insurance Tax Seminar for a number of years. Joe regularly speaks on topics related to the taxation of life insurance company products. He is a co-editor and contributing author of the Annuities Answer Book (Wolters Kluwer) and an occasional contributor to Taxing Times. He lives in the District of Columbia with his wife Janice McKeever and Devon (their soon to be trained German Shepherd puppy) and Trewithen (their never to be trained rescue cat). Annuities Answer Book provides succinct and authoritative analysis and commentary on various types of annuities, annuity regulations, and how annuities may be used to achieve specific financial goals.